With ColourVue Gremlin Sclera contact lenses you will look horrific - just like Jigsaw from Saw movie. They combine bloody red and deeply black colors and cover the whole eyes giving you an amazing effect. With ColourVue Sclera Gremlin contact lenses you will look amazingly scary and freaky during Halloween or other costume party. 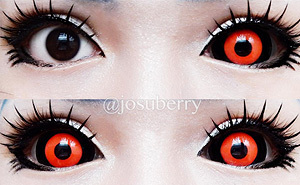 They combine black and red and cover the whole eye giving you an amazing effect that you won't find in any other costume contacts. Lenses like this have been so far used only in movie industry but now you can try them as well. ColourVue Sclera Gremlin contact lenses will cover your whole eye with black and red color, providing the most creepy effect you can imagine. These lenses are quite popular among make up artists and cosplayers as they do what previously was only possible with CGI. They get used very often particularly by Tokyo Ghoul fans, as they look exactly like a kakugan - a ghoul's mark. Wear one and turn into Ken Kaneki in no time!